A 30-credit FULLY ONLINE cohort program. The MEd in Early Childhood Education allows participants to inquire into their professional practice with young children. This engaging online graduate program offers opportunities to explore issues in early childhood research, theory, and practice. This Early Childhood Education graduate cohort is an interdisciplinary, cross-departmental program that consists of core courses in early childhood education (ECED) and related courses in other departments. This MEd program requires a minimum of 30 credits, including the seven online graduate courses (3 credits each) and 3-credit graduating project (24 credits) posted in the schedule. To complete their programs, students choose a minimum of 6 credits of electives. These may include 3-credit graduate or undergraduate courses at the 300- and 400- level, many of which are offered online, or on-campus courses. These electives require pre-approval from the program’s advisor. While you can complete this program entirely online you may take electives, such as the summer institutes, on campus. Courses are offered each year across three terms (one per term), starting in September 2019 and ending in May 2022. This is the proposed schedule and is subject to change. *ECED 590 is a 3-credit course, but the course encompasses two terms (Winter 1 and Winter 2). Eligible students may apply to transfer a maximum of 6 credits (2 courses) at senior undergraduate level towards the master degree. Students’ eligibility to transfer 6 undergraduate credits towards this Master of Education degree will be assessed after they are accepted in the program. Minimum of two years professional experience working with young children in an appropriate setting. *Related Fields include, but are not limited to: Child and Youth Care, Nursing, Psychology, Social Work, Family Studies and Sciences. 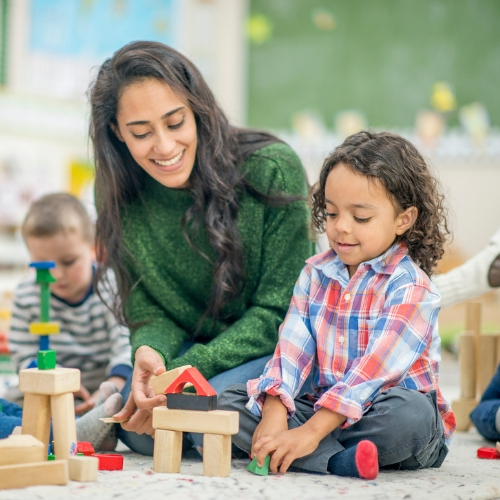 Applicants whose degree is in an unrelated field (e.g., Arts, Commerce, General Studies) may be accepted if they have completed a college or university certificate program in early childhood education from a UBC-approved institution. Professional reference(s): In the event of an applicant not being able to obtain a professional letter of reference (for example, for those applicants who have been employed for a number of years) a letter from a board or committee overseeing their current place of employment, or a letter from a professional in an agency that has collaborated with their program (for example, from a consultant and coordinator from programs like the Supported Child Development Program, if working with a child or children with special needs) will be acceptable. Applicants must submit a 500-word statement of intent with their application, which should outline their professional goals. Applicants must submit A 500-word description of a topic in the area of early childhood education that they wish to study in-depth in the program. For those students who have no access to a previous paper completed in the last 15 years, or to a publication, or report, please select one of the two articles uploaded here; provide a scholarly summary of the article with your own reflections and connections to practice. This summary has a word count of 500 words, in addition to the reference list that matches references provided in text (preferably using APA format; at the same time, MLA and other formats are acceptable). Reference: Hughes, S. (2010). “Today I had fun!” Playing outside a box inside a role drama Educational Insights, 13(4). Applicants must include a full professional resume with their application. Items covered should include: education, coursework, employment history, volunteer work or other related experience (i.e. publications, interests). The minimum degree requirement for admission is a 4-year bachelor degree. This is a Faculty of Graduate and Postdoctoral Studies requirement that cannot be waived, regardless of professional experience. Eligibility for candidates with a 3-year baccalaureate will be assessed on a case-by-case basis by the academic department and the Faculty of Graduate and Postdoctoral Studies. Please refer to the UBC Minimum Academic Requirements for international students. We also recommend that you review the English Language Proficiency Requirements to ensure you meet the English language requirements. If you require assistance with your application as an international student, please contact the Senior Program Assistant. Application Deadline: Application for 2019 is now closed. We are no longer accepting applications for the 2019 cohort. A cohort starting in September 2020 is proposed. To be updated on the future cohort, please click the "Subscribe" tab and enter your information. Program tuition will be divided into eight (8) installments of approximately $1,855.52 per term (domestic & international), plus applicable student fees, payable in September, January, and May of the program years. The program total is $14,844.16 plus applicable student fees. The figures quoted above are proposed for the 2018-2019 academic year. Meet the Program Advisor and Senior Program Assistant, and learn more about applying to become a UBC graduate student. There are currently no info sessions scheduled for this program. If you’d like to notified of any future information sessions for this program, subscribe via the last tab on the right and we’ll keep you informed by email. Subscribe below if you’d like to be notified of updates for this program. Please notify me with updates for the online MEd in Early Childhood Education cohort program. This multidisciplinary program, offered by the Faculty of Education, is a collaboration between the Department of Early Childhood Education and other departments. Learn more about ECED programs. Apply By: Application for 2019 is now closed.